Germany's new defense minister, Ursula von der Leyen, right, chats with German soldiers who have served in Afghanistan, at a training center in Letzlingen on Jan. 28. Von der Leyen has said she would like to see German forces participate more with other European troops in foreign peacekeeping missions. In an interview airing on this evening's edition of All Things Considered, NPR's Mary Louise Kelly interviewed German Defense Minister Ursula von der Leyen. The interview happened shortly after President Trump told NATO Secretary General Jens Stoltenberg that "Germany is a captive of Russia" and pays billions of dollars to Moscow for energy. The Defense Minister called Trump's statements, "wrong." Excerpts of the interview are available below and can be cited with attribution to NPR. A full transcript will be made available after the interview has aired. Audio clips are available upon request. "We can cope with it because the numbers are plain and simply not correct. Germany is independent what (sic) energy supplies are concerned because we are diversified," von der Leyen said. She later added, "There is no substance to that sentence." "That is a fair point," and pointed to that budget rising, and discussions she had on the topic with President Obama. 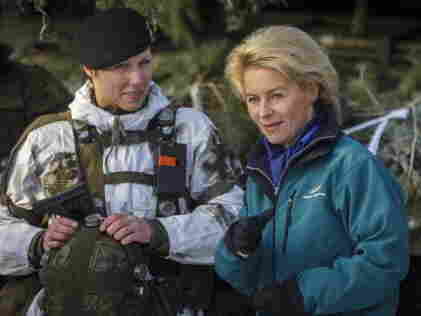 Ursula von der Leyen began her service as Germany's Defense Minister in 2013. She said attaching defense spending to GDP is a moving target for Germany since its economy keeps growing. Von der Leyen said she's ultimately "deeply convinced that the German/American friendship is a strong one" based on conversations with other US officials which don't match Trump's rhetoric. She was last in the US in June. "I've been talking to Senators and Congressman and Congresswomen and it was enormously reassuring to listen to them, how much they insisted telling me how precious our friendship is... "
The full interview airs on today's All Things Considered.